Not surprising, really, that this blog likes any and all equipment designed for taking photos while on a bike. 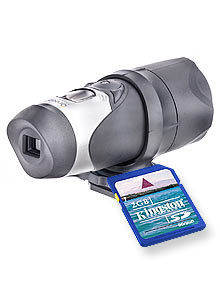 This 'All Terrain Camera 2000' - or ATC2K for those in the know - is a simple concept. Mount it on your bike and off you go. Or, if you're the type to wear a helmet, mount it up there if you prefer. Capture video of your ride or any other outdoor activity and either watch it on a TV with the AV-out function or download it to your computer for editing and uploading for all the world to see. We've seen them online in the UK for £109.99, including a 2GB memory card. There is probably a US site out there somewhere. AVI format in three sizes: 640x480, 320x240, 160x120. Two frame rates - 15fps and 30fps.